Knut Fredrik Idestam, born 28.10.1838 Tyrväntö, died 8.4.1916 Helsinki. Parents: Gustaf Idman (later Idestam when adpoted by his uncle), mining official, and Anna Sofia Trapp. Wife: 1865-1916 Maria Rosina Krook, died 1925, wife's parents: Major-General Carl August Krook and Hilda Holm. Children: Gertrud (Fogelholm), born 1865, her husband: Gustaf Fogelholm, managing director of Nokia; Elna Maria, born 1867; Karin Sofia, born 1869; Walborg, born 1870; Ingrid Elisabeth, born 1872; Martha Johanna, born 1875. 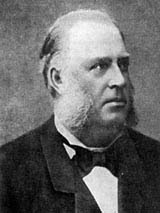 Fredrik Idestam imported wood-pulping technology from Germany, building Finland's first commercially successful groundwood pulp mill and later chemical pulp and paper mills. The industrial plants which he founded gradually developed into today's Nokia Group. In Idestam's view, the common good of the paper industry required a cessation of export competition. He was a key figure in the establishment of paper producers' associations. Fredrik Idestam's training was in Mining, in which he held a Master's degree; and, following in his father's footsteps, he planned a career as a civil servant in the Board of Mines of the Grand Duchy of Finland. In 1863 - 64, on a Finnish Senate (government) scholarship, Idestam undertook further studies in basic metals in Germany at the School of Mines (Bergakademie) in Freiberg, Saxony. While there, he was appointed as a mining engineer at the Finnish Board of Mines. But as early as the summer of 1864 his career plans changed. On his way through the Harz Mountains on his return trip from Freiberg, he visited a groundwood mill. This was a new invention: a factory which produced raw materal for paper from wood. The process and equipment had been developed by the paper manufacturer Heinrich Voelter. The plant that Idestam saw had already reached the stage where it was capable of commercial production. The demand for paper was increasing rapidly in the industrialising world - in Europe and North America. But production could not grow, because there was a shortage of the rags used as raw material and there was no way of increasing the supply. Idestam believed that Voelter's solution to the raw-material problem was the correct one. He realised the importance of this innovation for Finland. There was an unlimited supply of raw material in Finland's forests, and amidst the woods were rapids and waterfalls that could provide power for mills. As soon as he returned to Finland he ordered machines designed by Voelter from Germany, and he was granted an operating permit by the Senate on 12 May 1865, the date which today's Nokia group of companies regards as its foundation day. The mill began production beside the lower falls of the Tammerkoski Rapids in Tampere early in 1866. Idestam was not the first in his field in Finland. The pharmacist Achates Thuneberg had established a groundwood mill near Viipuri in 1860. Thuneberg's plant had been developed in Viipuri - apparently independently of Voelter - and had been built in Finland. But Thuneberg was not successful: his mill was not as good as Voelter's, and the small-scale venture soon petered out. In contrast, Idestam was successful and attracted competitors. Like Voelter in Germany, Idestam had to market his product energetically. Wood pulp was cheaper than rag pulp, but paper manufacturers and consumers regarded it as an inferior substitute - as 'wood rag'. From the Frenckell (rag)paper mill in Tampere, Idestam ordered paper whose fibres consisted of equal parts of rag and his pulp. In December 1866 the Tampereen Sanomat became the first newspaper in Finland to be printed on paper containing wood. The Helsingfors Dagblad in Helsinki soon followed suit. Idestam exhibited his groundwood at the 1867 Paris Exhibition and was awarded a Bronze Medal. This was the decisive breakthrough, as Idestam himself stated later. Voelter's mill received a Gold Medal at the same exhibition. It was only at this point that the world realised the importance of Voelter's process and equipment, and they began to come into more general use. Idestam's first competitor in Finland was the Tampere pharmacist Gustaf Adolf Serlachius, who had become familiar with the field as the manager of Idestam's mill, Idestam himself being prevented from running it because of his official post. Serlachius founded a mill at Mänttä in 1868. Tampere lost yet another pharmacist to the paper industry when Edvard Julius Granberg established a groundwood mill and paper mill at Valkeakoski in 1871. In 1868 Idestam built a second mill at Nokia, fifteen kilometres west of Tampere. A number of groundwood mills were established in Finland in the early 1870s. Finland had been some twenty years behind Sweden and Norway in the sawmill industry, but the wood-pulp industry began at the same time and developed at the same pace in all three Nordic countries. From the early 1870s to the beginning of the First World War, the share of the chemical forest industry in Finland's total exports rose from zero to 20 percent, and at the same time the value of Finland's total exports increased tenfold. Idestam transformed his firm into a share company in 1871. With his close friend Leo Mechelin, statesman and Finland's most prominent public figure in the late 19th century, he founded Nokia Ltd and transferred all activities to Nokia, where a new mill was built. Idestam's mills and Nokia Manor and its interest in the Nokia Rapids, which had been acquired by Mechelin, were transferred to the new company. Idestam owned well over half the shares in the firm. He resigned from the Board of Mines and his position there as Master of the Mint and devoted himself entirely to managing Nokia Ltd. Mechelin gave him important support by attracting capital investments and funding. The development of Nokia Ltd proceeded well. Idestam was a cautious business manager, and his financial planning allowed for future bad times. Although Nokia's investments in expanding its production and increasing the degree of processing were large, Idestam, unlike many other pioneers of Finnish industry, coped with the crises that arose, and in the early 1880s three paper machines were built at Nokia, as well as Finland's first sulphite pulp mill in 1885. The first sulphate pulp mill had already been established earlier at Valkeakoski - in 1880. Chemical wood-pulp now replaced cloth-pulp as a raw material for almost all paper qualities. By the late 1880s Nokia was processing all of its groundwood and chemical wood-pulp into paper. On Idestam's initiative and under his leadership, the paper-industry magnates founded their producers' organisations: a cardboard association in 1874, a pulp association in 1875 and a paper association in 1892. These were cartels used by the Finns to divide up their most important marketing area, the Russian market, and to eliminate mutual competition. Idestam was the general manager and chairman of the Paper Association until 1903. He retired from the management of Nokia in 1896. He was succeeded as general manager by his son-in-law Gustaf Fogelholm and as chairman of the board by Leo Mechelin.